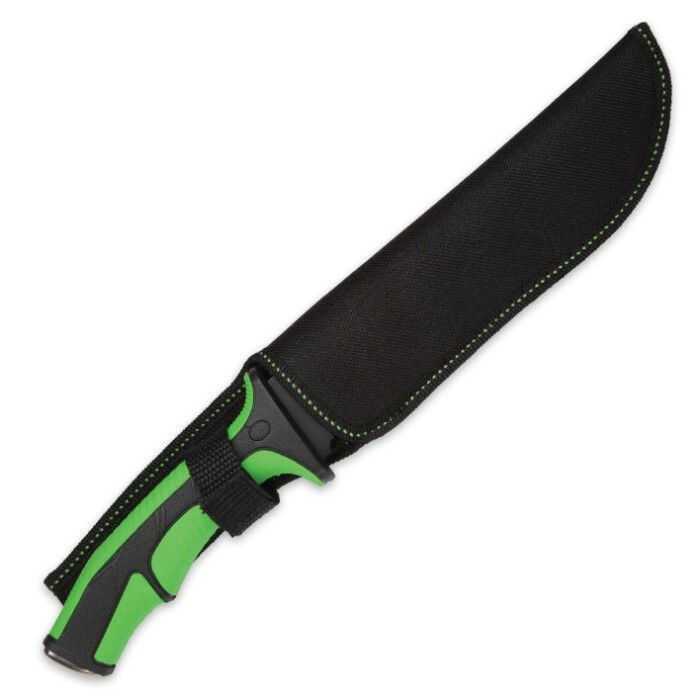 Black Legion Swampmaster Fixed Blade Knife with Nylon Sheath | BUDK.com - Knives & Swords At The Lowest Prices! Scorching deserts. Impenetrable jungles. Craggy mountaintops. And of course, soggy, hazard-laden swamps. The Black Legion Swampmaster is right at home in these and all of the world's harshest, most unforgiving settings. Its robust 7 1/2" clip point blade is forged from resilient 3Cr13 stainless steel, coated with a nonreflective black finish and honed to a razor sharp edge. Menacing serrations on the blade spine make quick work of tough branches and stubborn fibrous materials like rope. Thumb grooves - also on the blade spine - and a generous finger choil on the opposite edge allow for maximum control and precision while performing tasks that require a delicate touch. Ergonomically contoured rubberized grips yield supreme comfort and stability, and the hard stainless steel pommel provides a handy blunt striking surface. 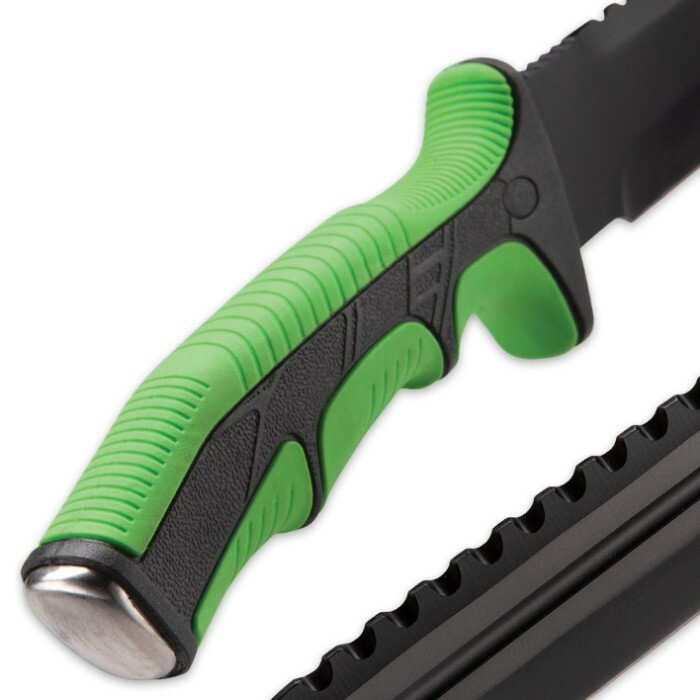 The Swampmaster includes a durable, water resistant nylon belt sheath for easy transport and quick access - especially important in treacherous environs. Best of all, this back country workhorse is remarkably affordable! You won't get this level of wilderness-busting potency from any similarly priced bowie anywhere else, so what are you waiting for? 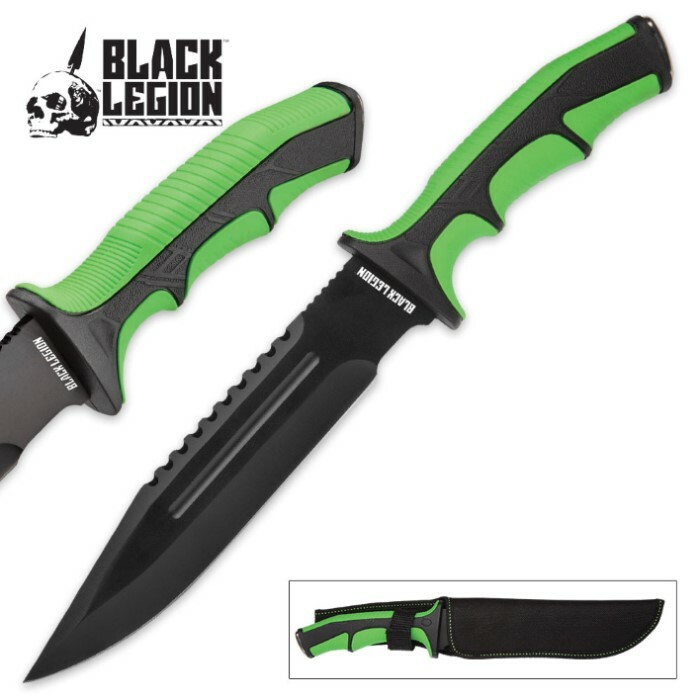 Order Black Legion's all-around incredible Swampmaster Fixed Blade Knife today, and start conquering the wildlands in your neck of the woods, be it desert, jungle, forest, wetland, tundra or prairie! Light, sharp, and super cool. The handle has a great grip. Love the neon green color as well. Black Legion rules. Thanks BudK!